Mikhail Kalashnikov's automatic rifle became one of the most familiar weapons on the planet. It was employed by the armies of dozens of countries, and incorporated in several national flags. But the AK47 also became a symbol of revolution around the world. It saw action on battlefields as diverse as Angola, Vietnam, Algeria and Afghanistan. It was also heavily utilised by Palestinian groups and famously appeared in the hands of Osama bin Laden. It's comparative simplicity made it cheap to manufacture as well as reliable and easy to maintain in the field. It became the most widely used assault rifle in the world. Yet Kalashnikov, although honoured in Russia, made very little money from his gun and once complained he would have been financially better off designing a lawnmower. Mikhail Kalashnikov was born on 10 November 1919 into a Russian peasant family in the village of Kurya, Altai Territory. He was one of 18 children, of whom only six survived. He was called up by the Red Army in 1938, and his design skills were used to improve the effectiveness of arms and equipment used in Soviet tank regiments. It was after he was wounded in October 1941, when the tank he commanded was struck by a German shell, that Kalashnikov began to design the firearm that was to make his name famous. The German army had pioneered the concept of an assault rifle, a weapon that combined the accuracy of a conventional rifle with the firepower of a sub-machine gun. Russian troops frequently found themselves outgunned by German weapons which were far superior to those available to the Soviet army. While he was in hospital he was approached by a fellow soldier who asked why the Russian army could not come up with a gun that would match that of the Germans. "So I designed a machine gun for a soldier," he said. "It was called an Avtomat Kalashnikova, the automatic weapon of Kalashnikov." There were teething problems with early prototypes but in 1947 he completed the Avtomat Kalashnikova model 1947, the name quickly shortened to AK47. The new rifle was adopted by the Soviet army in 1949 and Senior Sergeant Mikhail Timofeevitch Kalashnikov was awarded the Stalin Prize First Class. It was just one of many awards he was to be given, among them three Orders of Lenin and the Hero of Socialist Labour. In 1987 he was made an honourable citizen of Izhevsk, where he had lived and worked from 1949. 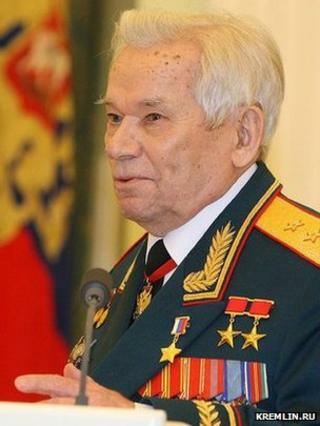 On his 75th birthday, he was promoted to Major-General by President Boris Yeltsin. However the simplicity of his weapon meant that he failed to gain much financial benefit from his invention. Dozens of arms manufacturers in other countries found the AK47 very easy to copy and few paid any royalties because of a dispute over patents. But late in life - when he was 83 - Kalashnikov was reported to have acquired a 30% share of a German company in exchange for the use of his name for products including Kalashnikov umbrellas and mineral water. But it is the AK47 which guarantees that his name will be remembered. Mikhail Kalashnikov refused to accept any responsibility for the many people killed with the weapon. "My aim was to create armaments to protect the borders of my motherland," he said. "It is not my fault that the Kalashnikov was used in many troubled places. I think the policies of these countries are to blame, not the designers."